Keli, thank you so much for calling on me at my cyber home today! Ever since I was a guest at your blog, I've been eager to have you stop by mine. Before we start visiting, I'd love to offer you something to drink. Since this is a Light Tea, I have a variety of teas and sweets to offer. What would you prefer? What a delight it is to be here, Gabrielle. You have such a lovely cyber home. I’ll take some peppermint tea if you have it. Oh, and a couple of those vanilla scones. They smell heavenly. Of course I have peppermint tea and help yourself to as many scones as you’d like. I will have some white tea and a chocolate scone, because, as I always say, if it's not chocolate, it's not worth it! Your dress is simply stunning, Keli! 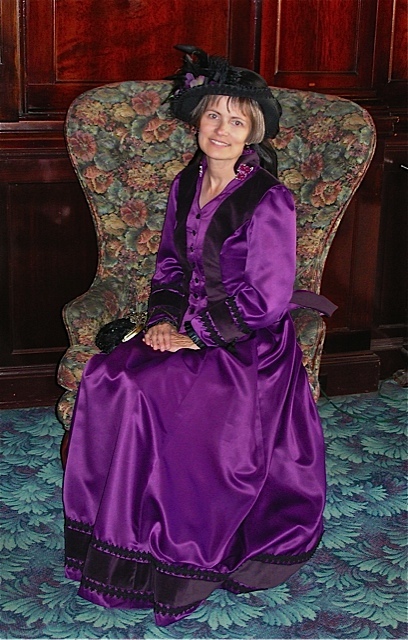 I love the vibrant purple - and the matching hat is a perfect addition. Where did you find it? Thank you. I’ll admit to being quite smitten with my outfit. The seamstress I hired outdid herself. She designed the dress and the hat. 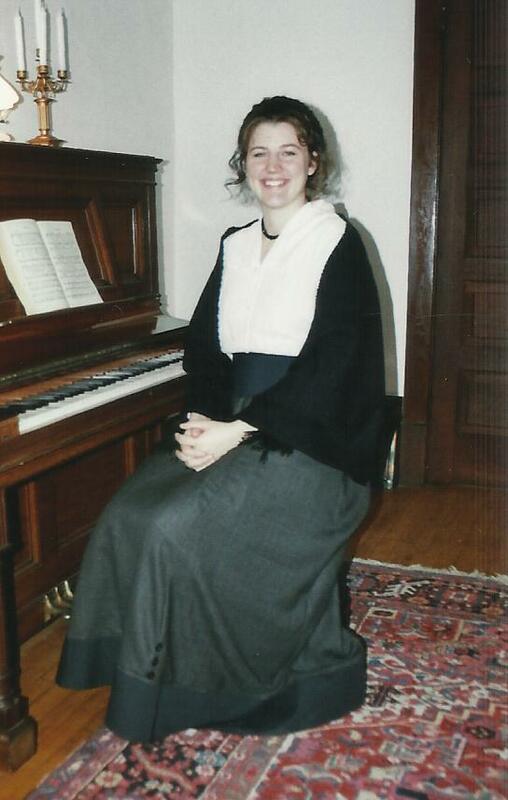 The gown looks just like the one my heroine, Elenora Watkins, is wearing in the final scene of my debut novel. I can’t wait to read your story and I’ll be looking for that dress now! 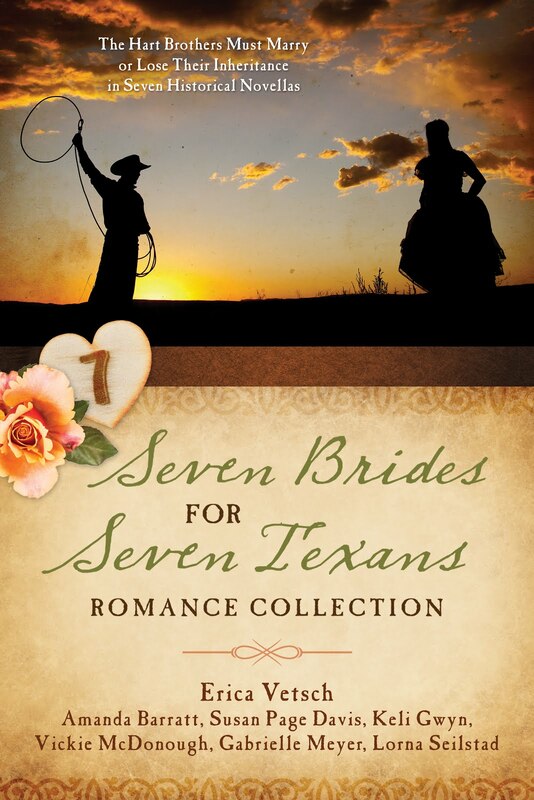 I’m eagerly awaiting the copy of A Bride Opens Shop in El Dorado, California that I won as part of the Bushel of Fun on your blog's Friday giveaways. By the way, did you know that when I began blogging in February of this year, your blog was one of the first I came across? Since then I've enjoyed getting to know you and watch you release your debut novel. I know you live near the setting of your book, but you haven't always lived in California. At one point you were in Germany. Can you tell us what brought you there? Before my dear Gwynly became a teacher, he served as a missionary in Germany, working with American high school students whose parents were stationed there. Gwynly returned to the U.S., gave up his job as a research chemist, returned to college, and got his teaching credential. He wanted to work with teens instead of making plastic. We spent four and a half years in Germany, living there from 1989-1993. We were there when the Wall came down and the Cold War ended, and when U.S. troops were sent to fight the first Gulf War. Watching history in the making was amazing. That does sound amazing! I’m sure Gwynly was happy to return to Germany with a bride by his side. Your blog is full of little tidbits about your life and I feel like you do a great job sharing the real life romance you enjoy with him. I love how you weave it into your day to day living. As a wife, what have you discovered is the secret to a successful marriage? I am definitely blessed. Gwynly is an amazing guy! I would say that what makes our marriage work so well is that we take the other person into consideration. We both put the other first much of the time, even when that means sacrificing what we want. Putting your spouse first isn’t always easy, but I’ve also learned it is one of the most important things we can do for our marriage. Another aspect of your blog that I enjoy is watching your writing journey unfold. A few weeks ago you had the privilege of seeing your book in print for the first time! I loved watching the video you made at the post office while you opened the box and pulled the book out. I was crying tears of joy with you. My seven-year-old daughter sat by me as we watched the video and when you mentioned that you'd dreamed of writing since you were seven, my daughter looked up at me with a huge grin on her face, because she wants to be a writer, too. You've been dreaming of this moment for over forty years, in your opinion, what do you think is the most important thing you've done on the road to publication? Oh Gabrielle, I love hearing about your daughter’s reaction. That is so precious. I think the single most important thing I’ve done to get where I am today is to study craft. Like many newbie writers, I was eager to get an offer of representation and a publishing contract. I sent out a handful of queries a year and a half into my journey, received well-deserved rejections, and learned that I had much to learn. At that point, I made a decision. I chose to stop writing for a year and learn all I could about how to craft a marketable story. That choice made a big difference. When I began rewriting the strongest of the five stories I’d completed at that point, I could tell my writing had improved. To see how close I was to having a story that would attract the attention of publishing pros, I entered the new version of my story in several contests. It did well, garnering me several wins and requests for fulls from final round judges. One of the judges, Rachelle Gardner, offered me representation. I still had work to do on the story, but I was more than willing to do it. My work did end up resulting in my first sale, which was quite rewarding. Putting your writing on hold must have been a hard thing to do, but it was a wise decision. I had to put my writing on hold when I learned we were expecting twins. My consolation was that, even though I wasn’t writing, I was still gaining insight and wisdom that I could add to my stories. As writers, our books are often birthed from our own life experiences, both the good and the bad. If you could go back to one moment of your life to relive, which one would it be and why? My, what a thought-provoking question. I would go back to a day before my beloved mother-in-law learned that her cancer had returned for the third and final time. I would give her a hug and kiss and tell her how much I love her. She knew it, but to be able to see her before her decline and let her know how much she meant to me one more time would be a real blessing. Your love for your mother-in-law is so evident in your answer, Keli. She was a blessed woman to have you as a daughter-in-law. 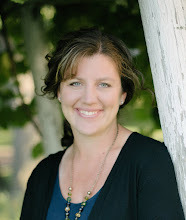 I recently saw your guest post on Jenny Blake's blog and she asked you a great question. She said: If you could have a meal with 3 living people, who would you choose and why? I want to know, if you could have a meal with three people who are no longer living, who would you choose and why? This one is easy. I would dine with my mother-in-law, my father-in-law, and my maternal grandmother. They were all believers and showered me with unconditional love. It would be wonderful to let them know that their support and encouragement filled my cup and helped me fulfill my lifelong dream of being a published author. I always hope that those people who go on before us, especially those who have furthered the Kingdom of God in our lives, have special access to see what we have done here on Earth. My grandfather passed on three years ago and I hope he can see how his faith has left a lasting legacy of believers on Earth. Thank you for stopping by my blog home today, Keli. It's been an honor to have you visit. I've loved getting to know you better and I look forward to calling on you at your blog home again soon. I'm praying that your debut novel will be a great success and that we'll be seeing many more novels from you in the near future. Thank you for having me, Gabrielle. What a gracious hostess you are. Spending time with you and your blog’s visitors is wonderful. I’d like to end by asking all of you a question. Who was one of the first people to believe in you and encourage you to follow your dream? 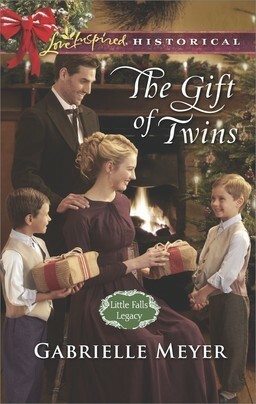 Don't forget to leave a comment for a chance to win a copy of Keli's novel. 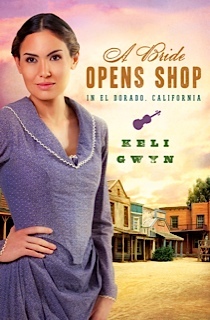 The drawing will close on Friday, August 3rd at 11:59 p.m.
Widow Elenora Watkins looks forward to meeting her new business partner, Miles Rutledge, who owns a shop in 1870s El Dorado. But Miles is shocked to see a woman step off the stagecoach. 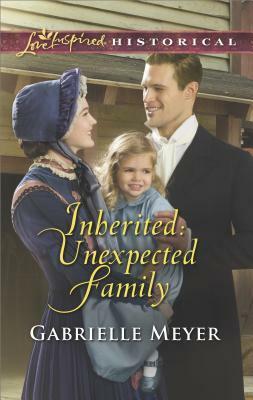 His rude behavior forces Elenora to reconsider—so she becomes his competition across the street. Can Miles win her heart while destroying her business? It's Friday again! Where is the summer going? School supplies are already on the shelves at the store. What?!?! Thankfully we still have another five weeks of summer vacation to enjoy - even if Wal Mart doesn't agree. I'm excited to share more Minnesota with all of you! This week I am taking you to one of my favorite places. These pictures were taken as we drove to my in-law's home on the lake and then from their backyard. This lake is especially important because David's grandfather bought a cabin in the 1960's and raised his family here. When David's dad had a family, he bought his own cabin and eventually tore it down and built a year round residence. When I dated my husband we spent hours and hours on this lake and fell in love here. Our children are the fourth generation of Meyers to enjoy this beautiful place. Farm and has been in the same family since it was built. right up to my in-law's driveway. came by to visit, via lake! A beautiful end to a beautiful day at the lake. ﻿What about you? Do you have a home or property that's been in the family for many generations? Don't forget to enter into my drawing for a free $15 Dairy Queen gift card! To enter please follow my blog (it's easy, just click the "Join this Site" button and follow the directions) and like me on Facebook! I will close the drawing on Sunday, August 5th at 11:59 p.m. You can be entered twice by following and liking! 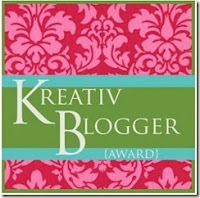 I've been given an award by my blogging friend, Gwendolyn Gage! Gwen was one of the first people I started following back in February when I discovered the blogosphere. I saw her name on Laura Frantz' website and clicked on her. I'm so happy I did, because I've absolutely loved getting to know Gwen and spending time on her blog. As a part of the award, I'm to share 7 interesting things about myself, and then grant this award to 7 other blogs. 1. I'm the fifth generation on my Dad's side of the family to live in Minnesota and the third generation to live in our hometown. 2. My mom is the mayor of our town. She's the second female mayor we've ever had. Here's a blog post I wrote in honor of her in March. 3. I'm a member of a Sister City Exchange program between my city and Le Bourget, France. In 2009 I visited France for the first time and stayed with a host family. I've helped host the French people in our city three times now and it's one of my favorite things to do. 4. I have a phobia of wood ticks. This hearkens back to a bad memory from childhood. 5. The greatest inspiration for my writing comes from things that are timeless: a thunderstorm, a lake or river, a grove of pine trees, an open field, a sunset. I'm also inspired by people and events in the past. 6. I've wanted to be a mommy since I was three years old. I remember walking around our house, when I was little, with a ball under my shirt, pretending I was pregnant! Next to being a wife, being a mommy is the greatest privilege of my life. 7. My sister is visiting from Colorado this week with her baby!!! I couldn't possibly pick only seven! If you read this post, consider yourself a winner and share it on your blog! What about you? Do you have any phobias of creatures? What's your greatest inspiration for writing? Minnesota is a diverse state. From the prairies in the south to the lakes and woods in the north, from the river valleys in the east to the prairies and riverbeds in the west, all the way up the North Shore of Lake Superior, this state has something beautiful and unique to offer. Every summer our family visits the North Shore, which is the area along Lake Superior in northeaster Minnesota. It's a whole different world than the rest of the state. Sometimes we only make it as far as Duluth, but other years we head all the way up to see Split Rock and even further north to see the breathtaking Gooseberry and Pigeon Falls. Duluth can be very chilly, even on the warmest days of the year, because of the lake effect. The city sits low in the Lake Superior Basin, so you have to wind your way down the hill to enter it. Often it is twenty degrees cooler at the bottom than at the top. The lake is so large, it feels more like a sea than a lake. The history of Duluth is vivid and rich and the shipping industry is still thriving to this day. It's a large tourist destination and has great shopping, lodging and attractions. Up the shore about forty miles from Duluth is Split Rock Lighthouse, one of the most popular lighthouses on the Great Lakes. The lighthouse is owned and operated by the Minnesota Historical Society and is one of the most visited sites in the state. Just a little further up the shore is Gooseberry Falls State Park. Another breathtaking stop in Minnesota. About an hour and a half further up the North Shore from Split Rock is the town of Grand Marais. I simply love this town. It has all the trappings of a seaside village. It's quaint and slow paced and I always love stopping in the little shops along the waterfront. Here are some of my favorite pictures from my last trip there. If you head even further north you will eventually hit Canada! But right before you do, you will come to Pigeon Falls. A gorgeous place to hike and enjoy the amazing scenery. What about you? Do you have a favorite place you visit over and over again? What do you think is the most popular historic attraction in your state? I'm blessed to be surrounded by friends who care about their health. My best friends are mothers, in their early thirties, and most of them are done having children, so they've begun bringing their "baby" bodies back into shape. Last week I had them over for an evening of visiting around the campfire and three of them are either training for half marathons, or they've run them. It was interesting to hear them talk about their training programs. Since I'm not a runner, I couldn't relate on a physical level with them, but I could on a writing level. In February of this year I decided I was going to start training for a marathon of a different kind: publication. The difference between writing for fun and writing to be published is like the difference between taking a stroll through the park on a Sunday afternoon versus running 26.2 miles in one day. Could you imagine the average person waking up one morning and saying: "I think I'll run a marathon today"? Never! It takes months, sometimes years of hard work, dedication and tenacity to be ready to run that far. So why would the average person wake up one morning and think they could produce a publishable novel? To be honest, I was that kind of person. Before February I had done some writing here and there. 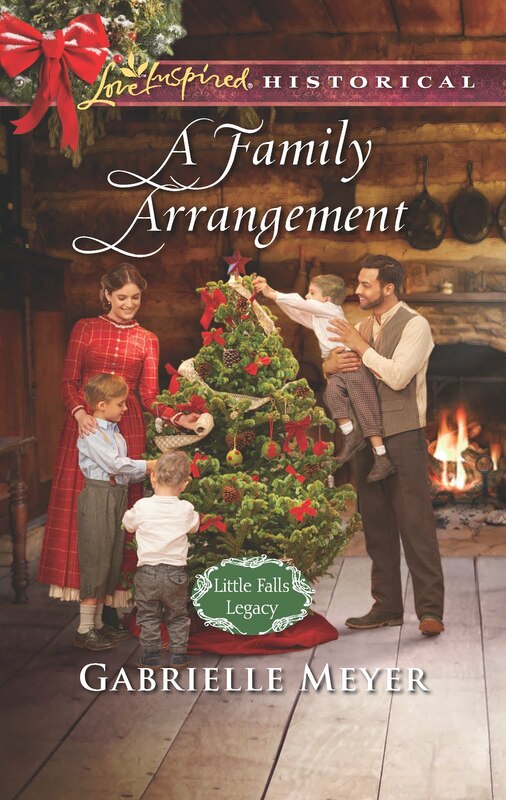 I've had publications in Minnesota Moments Magazine, I've done freelance writing for numerous organizations and I started a family blog last fall, but none of those things was anything like writing a full length novel. So, with very little training, I wrote the first draft of my first novel in about three months. I was proud of myself (how many people can say they actually finished a novel? ), but I knew it wasn't good. Wasn't anywhere near publication ready. That's when I decided, if I was ever going to get published, I would have to start a serious training program. Since February, I've learned so much about writing a novel. It isn't for the faint of heart. My training has pushed me to the edge of everything I know and asked me to go even further. 1. Commit to the Long Haul. When the going gets tough, or the work becomes exhausting, get up and keep going. I've committed to this. It's going to be hard. It's going to require sacrifice. It's going to hurt. But I know how much I want it - and that desire far out weighs the desire to quit. 2. Train with the Best! I've discovered that there are some GOOD writing coaches out there. James Scott Bell, Susan May Warren, Jody Hedlund, Rachelle Gardner, Randy Ingermanson, just to name a few. Study them. Learn from them. Discover what tips and secrets, along with hard fought principles, they've learned and want to share. I can't stress the importance of getting a good coach. It makes all the difference. 3. Don't do it Alone. 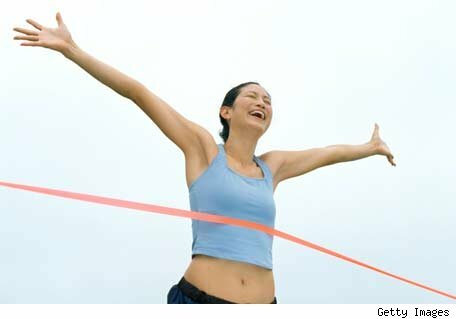 Get a good cheering section to help you achieve your goal and encourage you on until you've hit the finish line. For me, that's been my friends and family in my personal life, who surround me and believe in me, even when I don't believe in myself. And it's been the amazing, faith filled writing friends I've made online since February. Meeting other authors, in all stages of their journey, has been the best thing I've done in my writing career. I've met and interacted with multi-published authors, who astound me with their wisdom, debut authors who are just beginning to see the fruit of their labor, agented authors who wait in anticipation to hear the word "contract," and aspiring authors, like me, who are just beginning and learning right along side everyone else. What do all of us have in common? A passion to write the words that God has placed on our hearts and to do it with grace and humility. 4. Seek God and His Timing. This one is the most important and the hardest to do. As someone with a dream, we want to push and push until we see it come into reality, but we have to realize that there are limitations. Physical, mental, emotional and spiritual. God has a perfect plan. If we try to do things in our own timing, in our own strength, we'll fall flat on our face - just as a runner would if they pushed themselves too hard. As God is fitting each piece of the puzzle together, we want Him to hurry up so that we can see the big picture materialize. What we need to remember is that He can't fit the wrong piece in at the wrong time - each piece must be put in the puzzle in order so that the next piece can fall into place. 5. There's No Fast Track to Getting Published. Like everything else worth doing, it's going to be hard. This is the best advice I found when I was looking up marathon training, and it applies to both the runner and the writer: "Don't worry about your speed. Just focus on covering the distance." What about you? Do you feel like you're running a marathon towards the publication line? If you're published, what's the best advice you have for others on the same course? What have you learned is essential to seeking publication? Last week I took all four kiddos to the grocery store. Like always, I felt like I’d met my quota for exercising for the week after our shopping trip. After picking up my groceries in the parcel pick up area, I started to pull away from the building, but a very old woman and her daughter stepped out of the store’s deli just in front of me. They could have easily waited for me to pass, but I stopped and waved them forward. They both graced me with beautiful smiles and then the older woman began to step off the curb with her walker. It took more time than I’d anticipated and my girls in the back seat asked why we weren’t moving. I told them we were waiting for the ladies to pass. The little old woman continued to smile at me every once in a while and I smiled back, enjoying this moment to pause in the midst of my busy day. Eventually they moved past and we waved at one another. They both seemed so happy. The girls said she did. And I saw this as a great learning moment. “Who decides if you’re going to be happy?” I asked the girls. My oldest said she determines it and my younger daughter said God determines it. “I want to be happy,” said my oldest. “So do I,” said my second daughter. I love teaching my children real lessons during real life experiences, so I’m always looking for opportunities during our day. This won’t be the last time that I talk to them about the importance of being content whatever their circumstances, but hopefully this moment will be tucked away into their hearts as a good memory and they will think about it as they navigate through the ups and downs of life. Here are some of my favorite pictures of this past weekend. Just looking at them reminds me of the whispering wind through the trees, the smoke curling up from the campfire and the smooth ripples of water running past the boat. Ah, it's a great place to live. I hope you enjoy a little Minnesota beauty through my eyes. at the end of July. The lucky recipient? My husband Dave! He's such a good sport. In the evening my brothers lit off fireworks from the top of their pontoon and the kids were given sparklers to play with. I kept my shutter open on my camera while I took some of these pictures and I am amazed at the results! This coming weekend Dave and I will be heading off to another Minnesota Twins game and we'll also be helping my brother-in-law build a patio at his home in preparation for his wedding! On Saturday we'll be going to my cousin's high school graduation party. Another fun-filled weekend in store for us! There were a lot of wonderful moments on my wedding day, but one was so unexpected and delivered with such love, I still think about it in vivid detail with tears in my eyes, eleven years later. 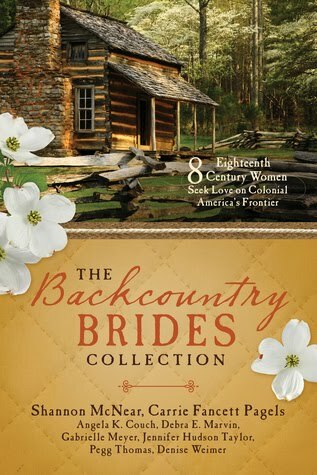 I'll back up a little...as a child I loved the movie Seven Brides for Seven Brothers. I have it on VHS, DVD and I own the soundtrack. 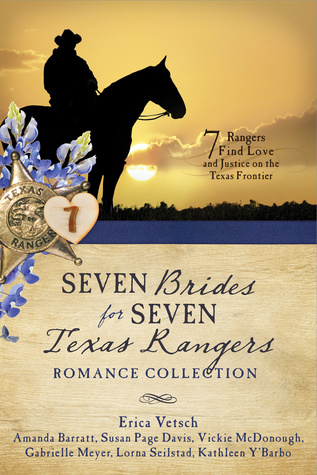 I have all the songs and dances memorized and I could list off all the brides and all the brothers...but I won't. 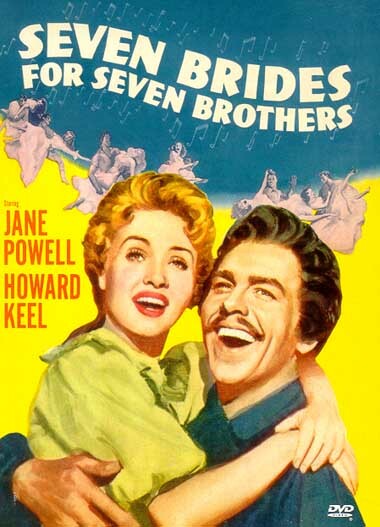 My favorite song in the movie is June Brides and because of it, I'd always dreamed of having a June wedding. When my husband and I became engaged in October of 2000, I only had nine months to pull it off, but I knew I could do it. During the wedding reception one of my bridesmaids (I had seven!) came to the mic and asked for the dance floor to be cleared. 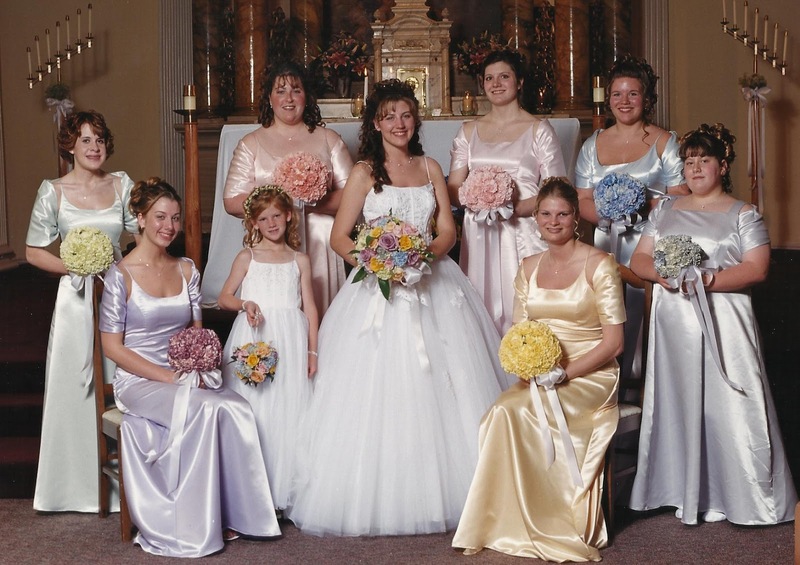 I was shown to a seat at the end of the floor and five of my bridesmaids went to the middle and arranged themselves to face me, the other two stood by my chair. 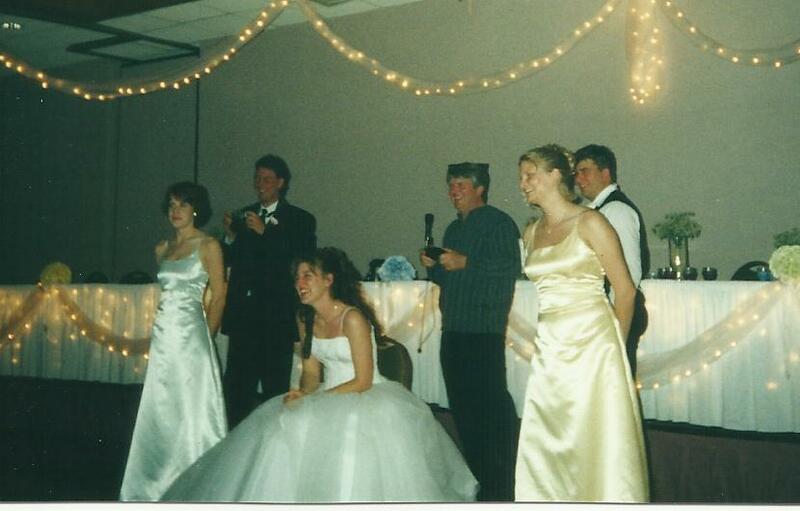 At this point I had no idea what they were doing - until I heard: "They say when you marry in June, you're a bride all your life." 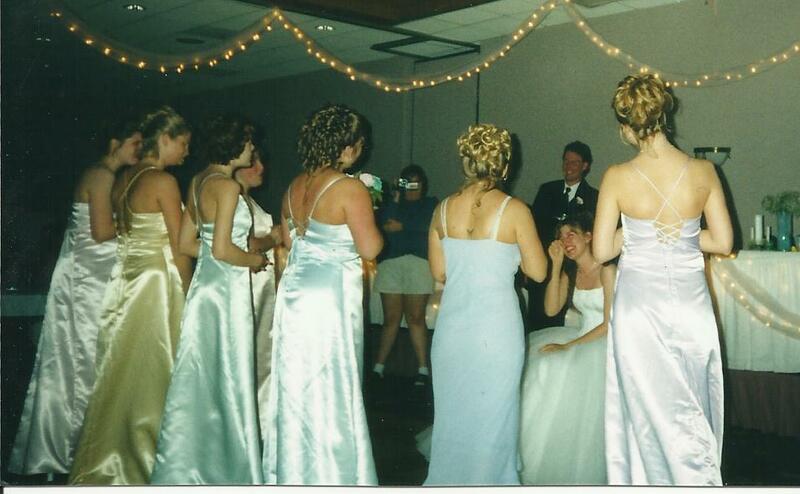 And then the music started to play and my bridesmaids performed the whole June Bride song - choreography and all! For as long as I live, I don't believe I will ever feel as loved as I did in that moment. 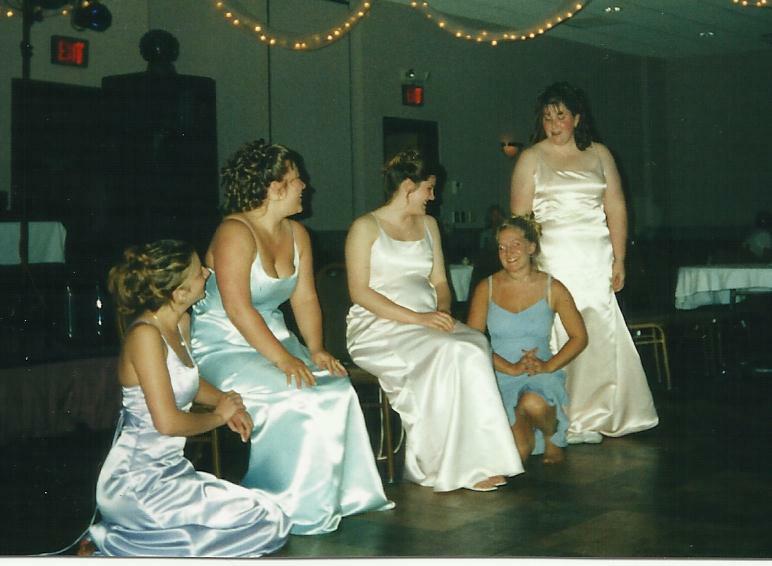 My bridesmaids were my sister, my sister-in-laws, a high school friend and some cousins - only one of them had ever been in a play and for the rest to perform this for me was well outside their comfort zone. One of my sister-in-laws was nine months pregnant. I knew how much courage this had taken for all of them - but they did it for me - and they did it because they knew how much it meant. I sat in that chair and I laughed and I cried and I laughed some more - not at their performance, but at their complete devotion to me. I love those ladies with all my heart and I'll never forget that moment. What about you? What was a highlight on your wedding day? 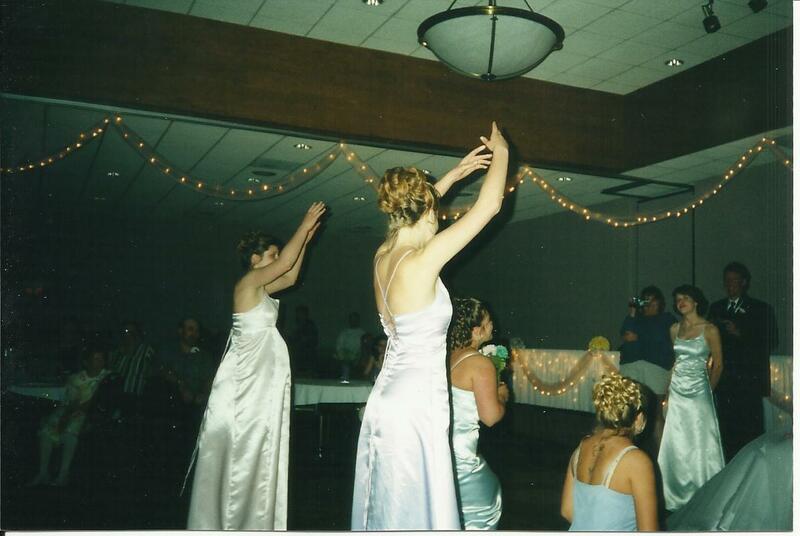 Have you seen something fun at a wedding? Last week we put a fence in our front yard to corral our two year old twin boys and protect them from danger. They’re usually running in opposite directions, making it difficult for us to spend any amount of time outside before we’re exhausted. I know the fence won't replace our watchful eyes, but it will go a long way in keeping the boys out of trouble and allow us to relax a little. When the boys mature and we can trust them, the fence will no longer be needed and their territory will be increased. There will still be restrictions for their safety, like not riding their bikes on the street, not leaving the yard unless they ask permission and being home at a certain time, but they won’t be confined to the fence any longer. Each boundary will be enlarged when we know they are mature enough and wise enough to handle the dangers and responsibilities that come with a new privilege. I’m finding the same to be true in my life right now. Ever since I began pursing my dream to be published, I am coming up against the temporary boundaries that God has set in place for my life. As a mother of four young children, and a wife of a small business owner, the time and energy I have to invest in my writing career is limited. Just like my two year old boys need a fence until they are older, I also need one for this season of my life. When my children are more responsible and they don't require as much of my time, my boundaries for writing will increase. But, for now, I need to know where my limitations are, because if I didn't, I would run off into all sorts of trouble. My passion and drive to write would take over and I would start to neglect my husband and children. There are times when I get cranky because I want to walk away from all the responsibilities and just write. But God reminds me that He’s called me to be the best mom and wife I can be. Sometimes that means living my dream out in front of my kids and sometimes that means closing the laptop and spending time with them. I’m smart enough to recognize that being a published author is a lot of hard work and commitment. Am I ready for that? No. To be honest, I’m not in a position to be able to offer my writing career that level of time and energy. It doesn’t mean my boundaries will never increase to allow for those things, it just means that for now, it’s not time. I can continue to write and learn and build friendships with other writers, but I'm not quite ready to take it to the next level. How long will it be? I'm not sure, but I know I need to be patient and respect the limitations that God has set in place for me. Just like the fence is there to protect my sons, God's boundaries are there to protect me. Someday, in God's perfect timing, they will be removed and my territory will be increased. What about you? What boundaries has God set in place that you run up against? What boundaries has He increased? Do you struggle waiting for God to enlarge your territory? What about you? What did you do for the Fourth of July? Are you still celebrating? operated parasail we saw over the lake. A couple of patriotic cuties!